The seastars scattered over the beach clinched it—Harry and Claudia Bray knew this bit of land on Washington’s Key Peninsula was for them. 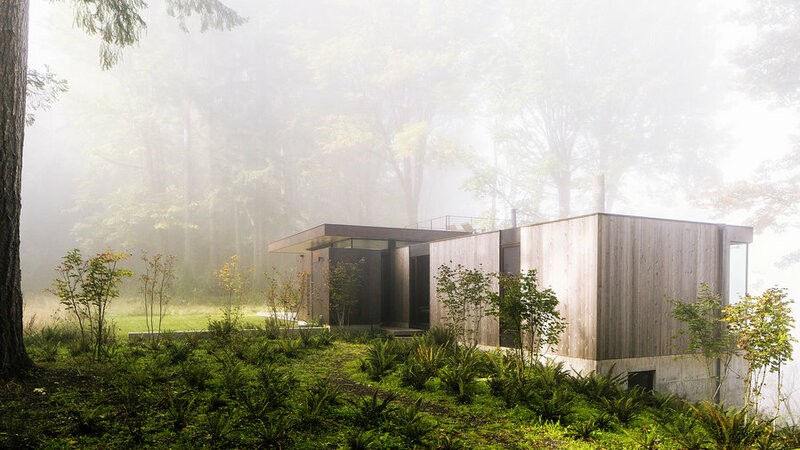 “Walking up the forested driveway with the sun coming through the trees, and seeing the water and the mountains … it was just what we were looking for,” says Claudia. Whether it’s just the couple or a crowd, though, the agenda remains pretty much the same: kayaking, beachcombing, foraging for mushrooms, even oyster farming (they’re expecting their first harvest this summer). 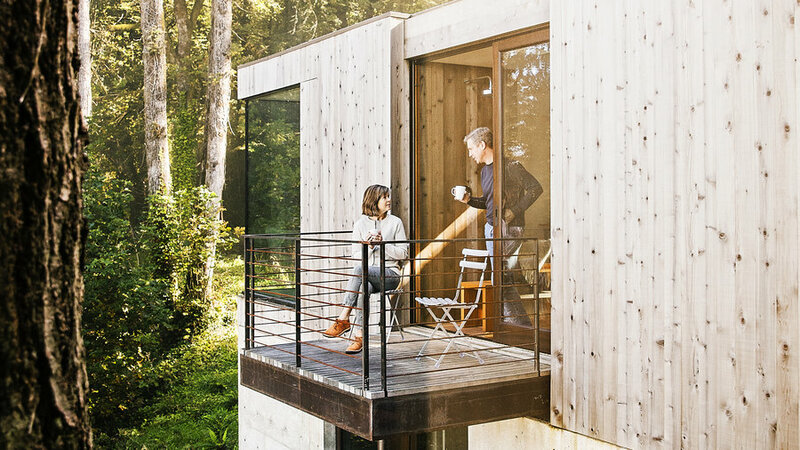 The dwelling may be modern, but it’s a cabin life. 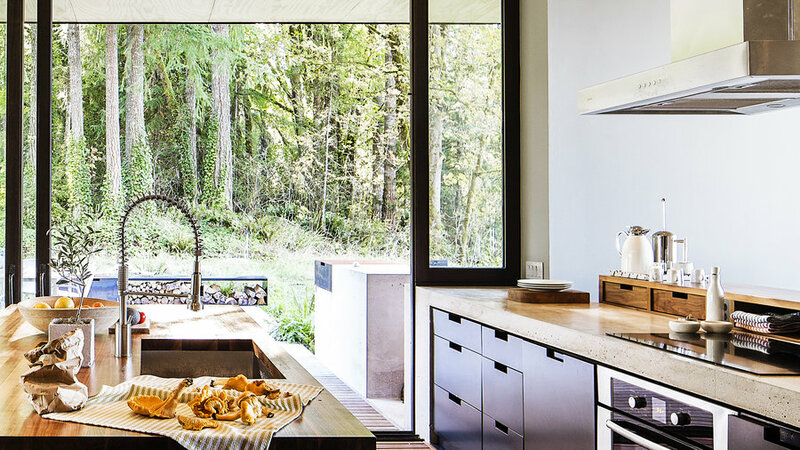 For the interior, the couple had one request: Keep it “rustic, and not too precious,” says architect Eric Walter, who designed the home with architect Steve Mongillo. 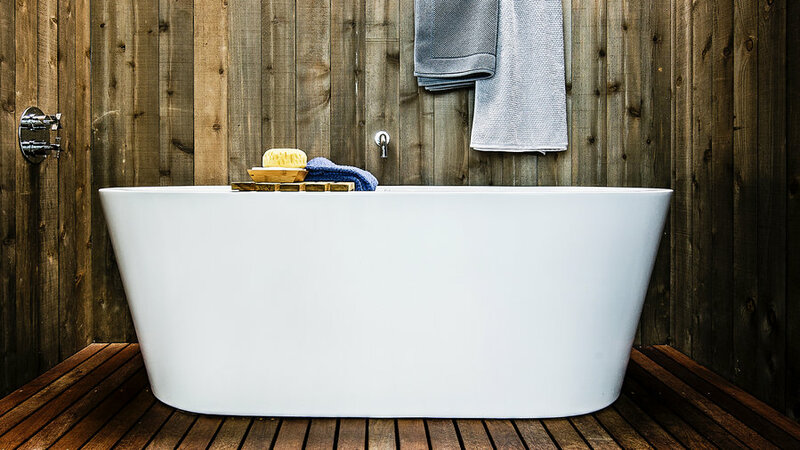 “Claudia and Harry wanted to be able to come up here with their wet dog and muddy boots.” So Walter and Mongillo chose honest, unfinished materials—cedar siding, ipe flooring, walnut built-ins—and crafted them into unobtrusive design details. 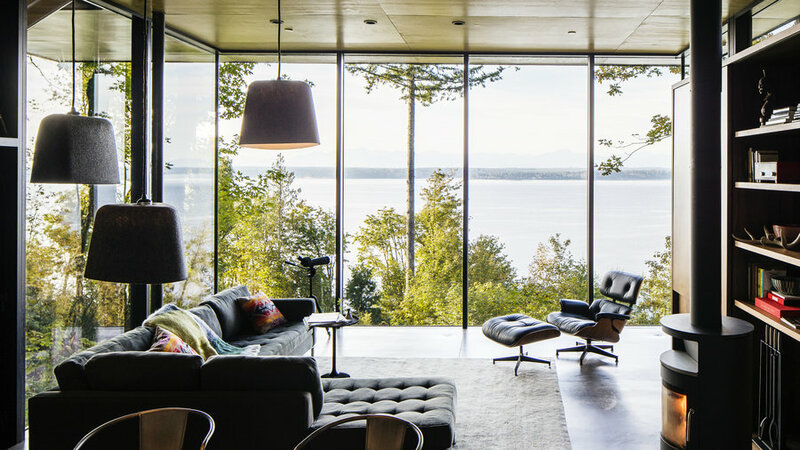 Closets and pantry doors almost disappear into the hallways, flooring extends from the kitchen to the deck, and simple window frames seem to fall away so all that’s left is the view. “Mornings we can sit here and stare out for hours,” says Harry. “The other day, we saw some western tanagers,” Claudia adds. “I said, ‘You make the coffee,’ and Harry said, ‘No, you make it.’ ” Neither of them could walk away. 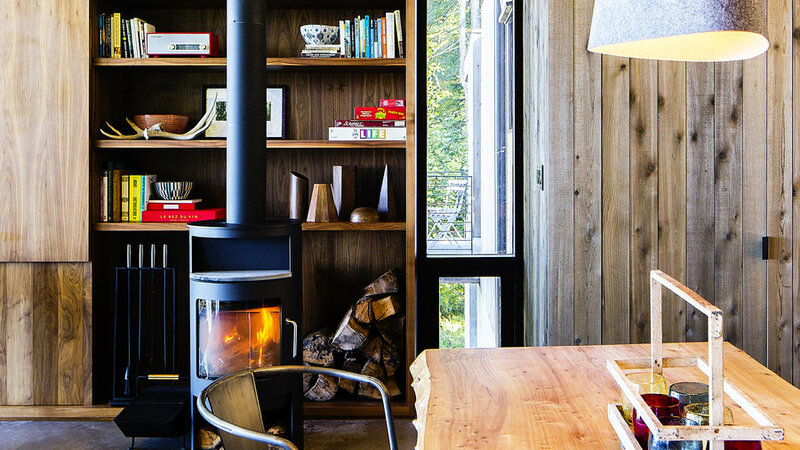 The Swedish wood-burning stove makes for cozy winters (though it’s not the cabin’s main heat source). 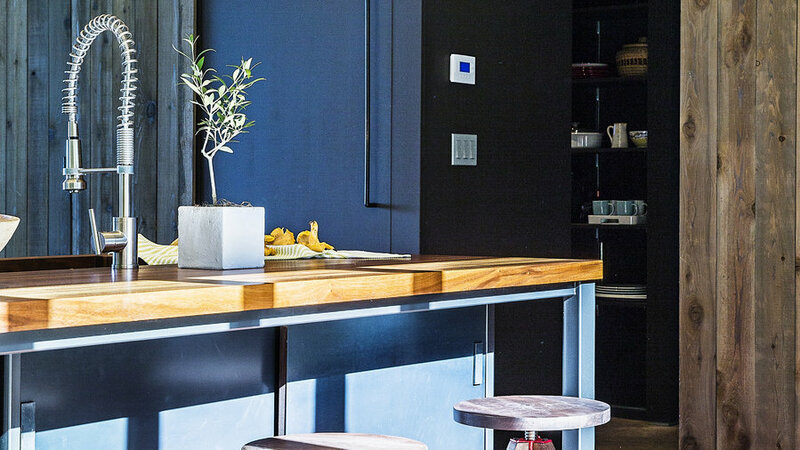 The kitchen walls slide aside to access the 450-square-foot deck that includes a barbecue station. Red components in industrial-style stools add life to the otherwise subdued palette. 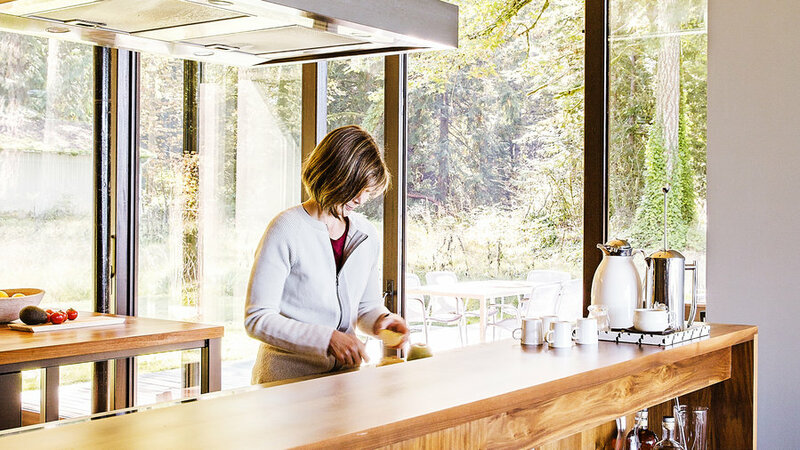 A built-in walnut storage cabinet separates the open kitchen and dining area. 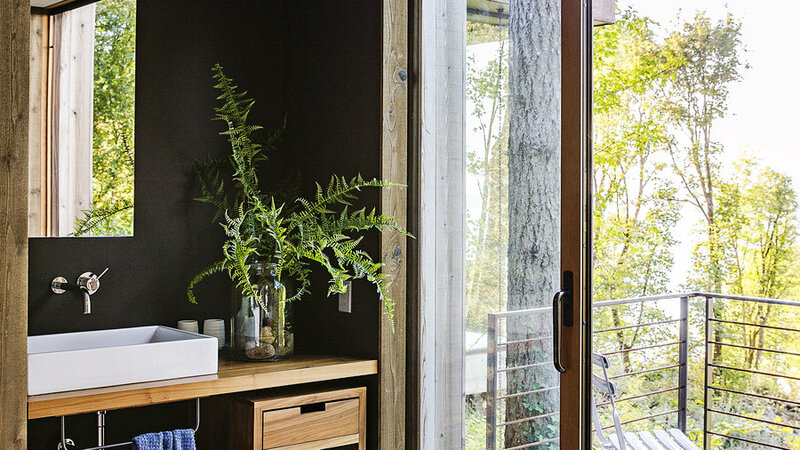 A sliding glass door, skylight, and cedar siding make the bathroom feel alfresco. 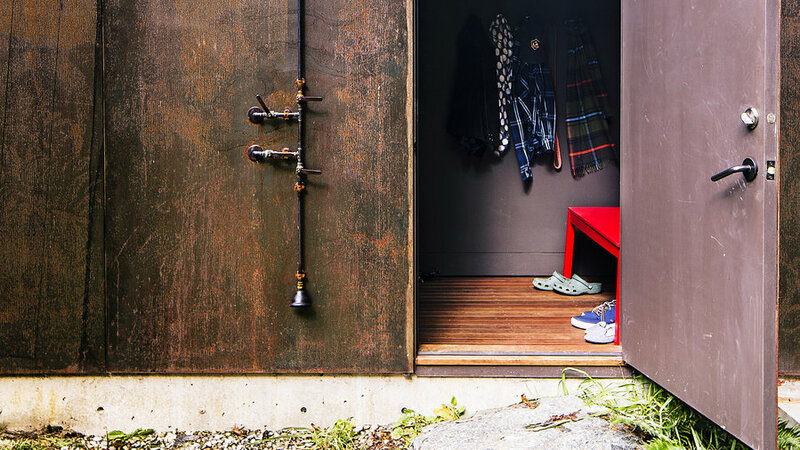 What looks like the front door is actually the home’s mudroom. A small outdoor porch leads to the more formal entry in between the mudroom and the main part of the house. Virtually seamless closet doors surround the window seat in the hallway. 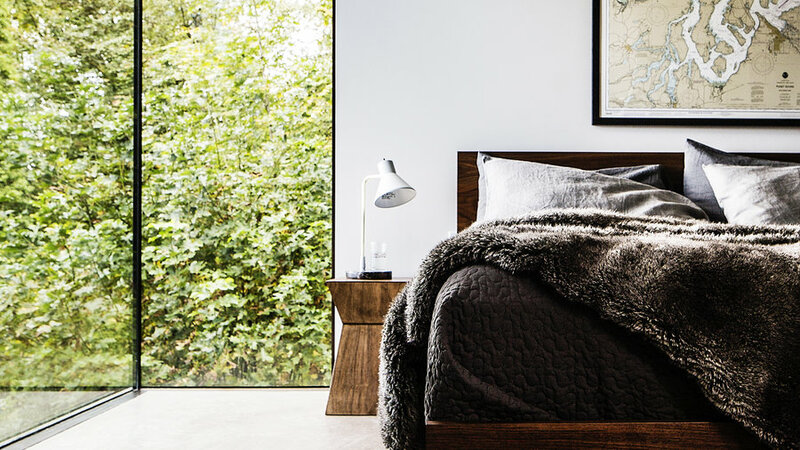 Just beyond, you can see the built-in, low-profile desk in the master bedroom. From the vantage point of the deck looking back into the kitchen, you can see the outdoor barbecue station, the way the ipe flooring merges indoors, and how the refrigerator and pantry doors almost disappear. 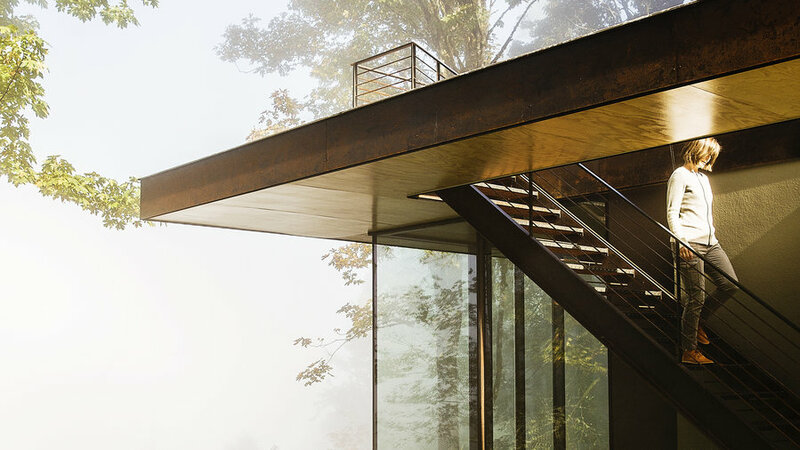 The glass walls slide almost completely aside to make the deck and kitchen function as one large room. The path up from the beach leads straight to the mudroom. The floor drains so the Brays can hose off their muddy boots and dog.